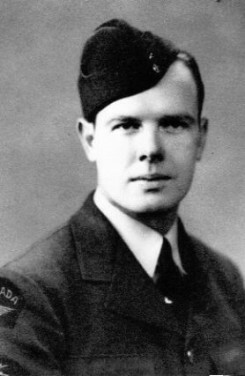 Sergeant Arnold Murray 'Gint' Shewan, RCAF, (1914-1983) son of James Brock Shewan and Agnes (Karn), enlisted in April 1941 and was sent to the University of Toronto to train as a Radar Mechanic. After training, he was posted to Halifax and in 1941 he was shipped to Bournemouth, England where was attached to the Royal Air Force and then based at the radar station in Rosehardy, Scotland until 1944. He married an English girl, Grace Major, and was stationed in Ireland before being trained in Southern England to go to France on a mobile radar tour. However, he was repatriated to Canada in August 1945 and never travelled to France.